When counting down the ways Apple set the bar for smartphones, it’s safe to say that the phone’s built-in camera—even with the improvements introduced with the iPhone 3GS—won’t find its way onto the list. With low resolution—the 3GS offers 3 megapixels, the other models just 2 megapixels—and no flash or zoom, the iPhone’s camera leaves a lot to be desired. Tools You Can Use: Camera Genius offers more than half-a-dozen features that are otherwise missing-in-action from the iPhone’s built-in camera. Camera Genius can’t really do anything about the iPhone’s camera hardware. But the app from CodeGoo can help you take better pictures with a number of features that try to compensate for the iPhone’s photographic limitations. The app’s Zoom feature lets you zoom in close to your subject by moving a slider across the screen. Since the iPhone’s camera doesn’t have an optical lens, you do your zooming digitally. There’s a drawback to this approach: the further you zoom in, the more pixelated the image becomes. If you zoom in just a little bit, the picture comes out looking pretty good; zooming all the way just trashes the image. Sound Capture enables you to take a hands free picture by saying "cheese" or otherwise making a noise. Once this option is enabled, the iPhone’s microphone will listen for a loud enough sound to activate the shutter and take a pic. This could really be handy for group shots. 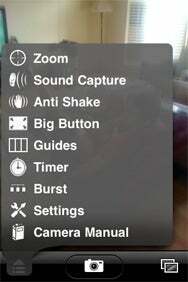 Anti-Shake goes a long way in preventing those blurry pictures that can be so frustrating. The Anti-Shake option uses the iPhone’s accelerometer to monitor its movement and as soon as your hand is steady, it snaps a shot. This is probably my favorite feature of Camera Genius, as it solves a long-time problem I’ve had with blurry pictures from the handheld. Timer lets you automatically take a picture after a set time. It’s really unbelievable that Apple never included such a feature from the start. Camera Genius lets you choose from 2, 5, 10, 15, and 30 second delays. 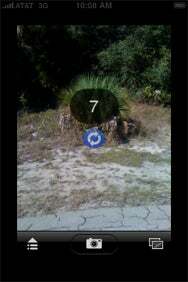 (A newly added repeat timer lets you capture multiple photos at 10-, 15-, and 30-second intervals.) There is a beep for each second as it counts down so you can gauge when the picture will snap. Big Button turns the entire screen into a shutter button, allowing you to tap anywhere to take a picture. This makes snapping pictures of yourself much easier when the screen is facing away from you. The Final Countdown: Camera Genius’ Timer tool lets you automatically take a picture after a set time; a repeat timer lets you capture images at different intervals. Guides makes framing your subject easier by putting lines over the on-screen picture. There are a few different grids you can choose from to help center your picture, make sure the horizon is level or take advantage of the rule of thirds. Recent updates added other capabilities, such as a burst shooting mode that lets you take shots in rapid succession, confirmed saving, and the ability to edit the location stamp and add your own captions. You can also share photos via e-mail or through the clipboard. All of these options are neatly tucked away behind a menu button at the bottom of the screen. Once you’ve taken your pictures, Camera Genius lets you preview them without having to leave the app. Camera Genius is quite useful in helping you to take better pictures with your iPhone and each of its features worked as advertised. The only complaint I had was the lengthy amount of time it took to save a picture after taking it. Still, this $2 app goes a long way in making up for the inadequacies of the iPhone’s camera.